Want a slice of leather heaven? Launched in January this year, the Maketh Project offers leather crafting workshops at their cosy little space. Benita Lee gets hands-on with the creative trio. Who they are: From the people behind year-old projects Forest Child, which specialises in handmade and customised leather products, and The Travelling Trunk – an online store hawking clothes for men and women, home décor items and accessories – comes this sweet collaboration of leathery proportions. And believe it or not, the founders are all female. 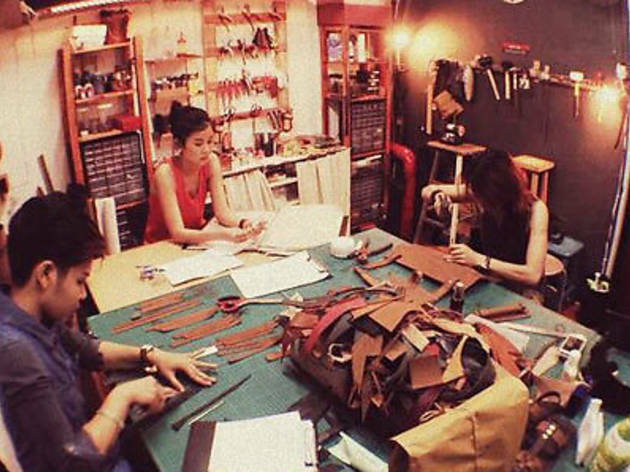 28-year-old Adlina Adil, an actress on local TV channel Suria, got to know Addynna Azlinor, 27, and Rozeryna Rothman, 28, through mutual friends and decided to start a leather crafting community for people to create beautiful handmade items, which are ‘sometimes silly, sometimes quirky’. Their name is a Shakespearean-style play on the word ‘make’, since no one else had snapped up the moniker. Both Addynna (the chief crafter) and Rozeryna of Forest Child are self-taught leather makers, learning from online websites, YouTube and an experienced mentor who showed them the basic skills and techniques needed; they recently roped in Adlina to join their venture, which they hope will reach out to people from all walks of life, from kids to the elderly. Nestled on the quiet Bali Lane next to menswear store Tuckshop & Sundry Supplies (which also organises leather workshops), Maketh Project sits in the back room of music store Straits Records on the second floor, above hipster barber shop Hounds of the Baskervilles. Riding on the ‘handmade crafts’ wave, the trio is excited to share their passion for leather and offer others an opportunity to experiment with the versatility of the material. What they do: Whether you’re a total newbie or an experienced expert, everyone’s welcome here. Their ‘free and easy’ leather crafting workshops consist of Think Small ($37.90) for beginners to start off with little items like cardholders and key chains, Think Big ($60.90) to build larger creations like bi-fold wallets and clutches, and Think Creative ($42.90) for those who live outside the box to experiment with satchels, backpacks and more. Wanting to share their knowledge free-of-charge, the leather girls (they laughingly claim that’s what they’re known as) only charge for tool rentals and material cost (which includes leather and basic parts – extra accessories or charms are sold per piece), in an effort to promote the platform as an experience for people to freely express their creativity. With sessions from Monday to Sunday (except Fridays and selected public holidays), you get to choose from different three-hour time slots: noon, 3pm and 6pm. But not to worry, you can spend the entire day there if you wish to take on a more time-consuming project, or simply come back another day. Each workshop is customised to suit your needs, so think of them as teachers who will guide you and show you the skills needed to craft any kind of leather product you want. All you have to do is turn up with a design in mind and pictures to refer to (or you can pick one from their list and tweak their basic template for a unique spin), and the friendly girls will be on hand to help or give you your space, whichever you prefer. Not so much structured, the Maketh Project is more of a venue for leather lovers to convene and create their own designs using the space, guidance and tools provided. They also accept customisation requests, if you’d rather leave it up to the experts. And look out for future furniture crafting workshops as they take things further to expand their repertoire. Get your craft on!